This recipe tackles that issue where skinless chicken pieces are used since the skin doesn't get too crispy in the oven as it would fried. The chicken then marinates in a buttermilk brine to keep the meat tender and juicy. Rather than using the traditional dredge process of egg wash, flour and breadcrumbs, the chicken is dipped in a mixture of egg and mustard, allowing some additional flavor and helps the coating to stick. The coating is also different from what I've tried in the past. For the coating, this recipe calls for Melba toast crumbs that are processed down to a sand and pebble consistency to allow some texture. 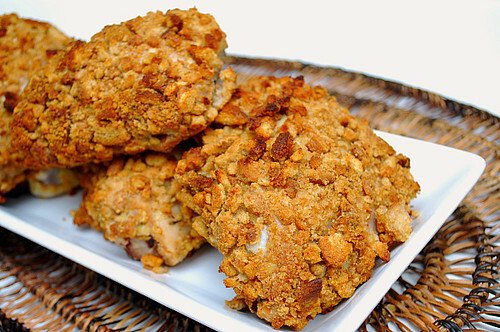 The Melba toast crumb coating is the key to a crunchy chicken in the oven. Lastly, instead of placing the chicken directly on a baking sheet, the chicken is cooked on a wire rack to allow the heat to circulate around each piece of chicken while it bakes... and there's no need to turn the chicken during the baking process! Another bonus is the ease of clean up since foil is used to protect the baking sheet. Adjust oven rack to upper-middle position and heat oven to 400 degrees. Line sheet pan with foil and set large flat wire rack over sheet pan. Separate the chicken into drumsticks and thighs. Remove the skin and pat dry.To make Melba toast crumbs, place the toasts in a heavy-duty plastic freezer bag, seal, and pound with a meat pounder or other heavy blunt object. Leave some crumbs the size of pebbles in the mixture. Drizzle vegetable oil over Melba toast crumbs in a shallow dish or pie plate; toss well to coat. In a second shallow dish or pie plate, mix eggs, mustard, thyme, salt, pepper, oregano, garlic powder, and optional cayenne with a fork. Working one piece at a time, coat chicken on both sides with egg mixture. Set chicken in Melba crumbs, sprinkle crumbs over chicken and press a mix of sand and pebble crumbs onto the chicken to coat. Turn chicken over and repeat on other side, then shake off excess crumbs and place on rack. Bake until chicken is deep nutty brown and juices run clear, about 40 minutes. * To make ahead/freezer meal - Prepare the chicken and coat completely. Once coated, place the chicken on a baking sheet in a single layer and freeze uncovered. 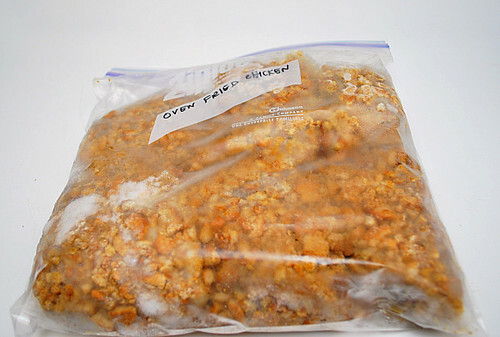 Once frozen, place the chicken in a single layer inside a gallon sized freezer bag; seal and freeze. When ready to prepare, partially defrost chicken. Adjust oven rack to upper-middle position and heat oven to 400 degrees. Line sheet pan with foil and set large flat wire rack over sheet pan. Place chicken on the rack and bake in the preheated oven until chicken is deep nutty brown, about 40 minutes. Decrease the oven temperature to 350 and bake the chicken for an additional 10-15 minutes or until juices run clear. really really helpful joelen. this is awesome. 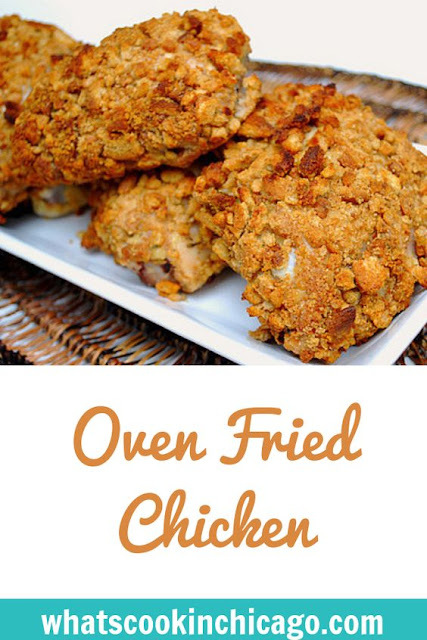 i would make this with your oven fried buttermilk chicken. you are a gem! Delicious! I used breasts instead of legs and cooked it for half the time. Next time I think I will use the processor for the Melba toast since I didn't smash the pieces small enough by hand. I like how easy this recipe is!